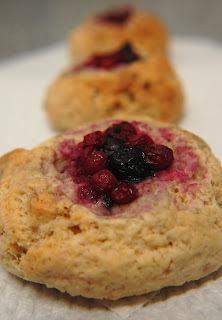 Of the Kitten Kind: Vegan Sweet Mixed Berry Rock Cakes. Vegan Sweet Mixed Berry Rock Cakes. These rock cakes are really delicious, sweet and lush. On top of that, they are really easy to make. I was really surprised. Initially, I wanted to fill them with some soaked apricots, but my local shop didn't stock dried apricots. Weird, I know. Who doesn't stock apricots? They also stopped stocking dairy free, accidentally vegan cooking chocolate. Sad face. Alas, they do sell soy milk, nuttalex (vegan margarine), raw sugar and self raising flour. And that's exactly what these buns need, baby! You will need: a bowl, a baking tray, an oven, pre-heated to 190 degrees Celsius or 374 degrees Fahrenheit. Two cups of self raising flour. Two tablespoons of vegan margarine. One third to half a cup of soy/nut milk. Half a cup of raw sugar. Quarter of a cup of frozen mixed berries, thawed. In a bowl, add the flour, salt and margarine. Using your fingers, mix it all together until the butter has all been rubbed in. Add in the milk a little at a time, until it forms a firm dough. Put the mixture on the side and kneed it until it's all nice and, well, dough-like. Pull it apart into 7 equal pieces and roll them into little buns. Put a hole in the centre of each one so that they resemble birds nests. Add in the pieces of fruit, just like in the picture. Glaze the top of each bun with a little of the milk and bake for about 20 minutes or until golden brown. I made these and they are so delicious! I love them. I'll be having them for lunch every day this week. Love your blog!